Whether it’s for your daughter or granddaughter, a playhouse for girls is sure to be appreciated by the little princesses in your life. Childhood is a time for learning, but just as importantly it’s a time for playing and having fun. After all, it’s through playing that our youngsters develop their creativity and learn to use their imagination. It can also help children develop their independence, especially if they have a space of their own to play in (under the appropriate supervision of course). 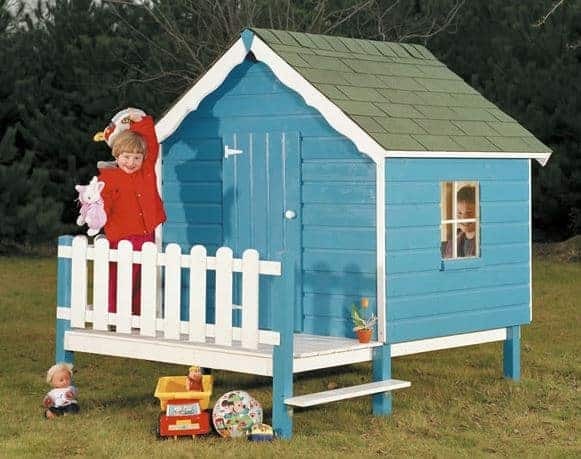 That’s why playhouses have become so popular with children and adults, so if you’re thinking of being one be sure to take a look at our WhatShed guide to the top 20 playhouses for girls on sale in the UK today. Having said that we personally feel that there is nothing to prevent most of the playhouses on the list being suitable for boys either. A varied range of factors were taken into consideration when we were selecting the best playhouses for girls. Of course, looks are important as they have to be attractive to young eyes. Value for money was also an important consideration, so you’ll see that we’ve been careful to compile a selection to suit all budgets. Size is also important, especially for those who have several children who are going to be using the facility, as is the play opportunities that it offers. 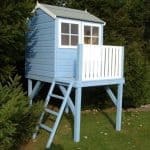 One thing you won’t have to worry about is safety, because all of the playhouses in this list meet the strict EN71 safety standard relating to children’s toys and playhouses. 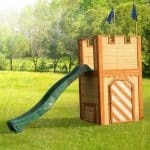 Here then are the WhatShed 20 playhouses for girls that can be bought online in the United Kingdom today. 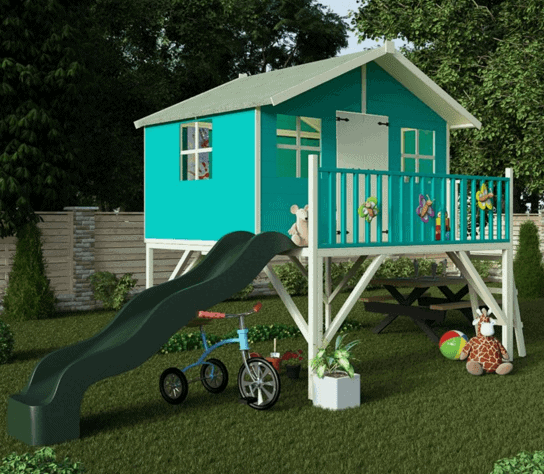 Congratulations to the BillyOh Lollipop Tower Extra with Green Premium Slide for gaining a very deserving place at the top of what has been a very competitive list of the 20 best playhouses for girls available in the UK today. 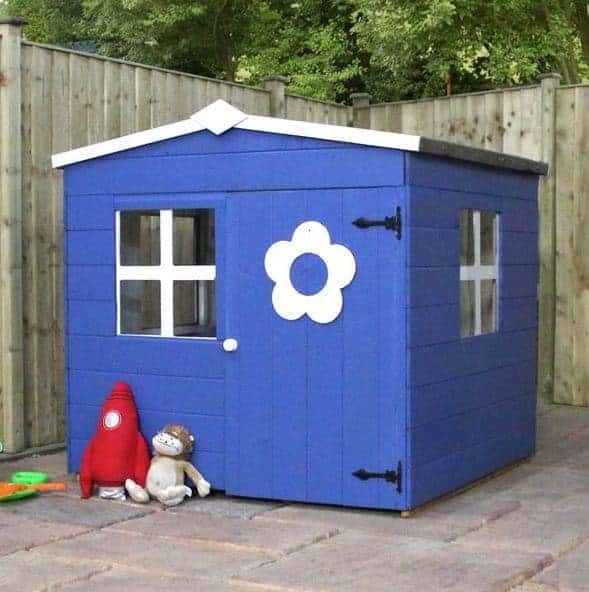 Whether you’re looking for a playhouse for the special girl in your life, a large metal shed for your garden, or all points in between, WhatShed will keep on bringing you the reviews to help you make a great choice every time. 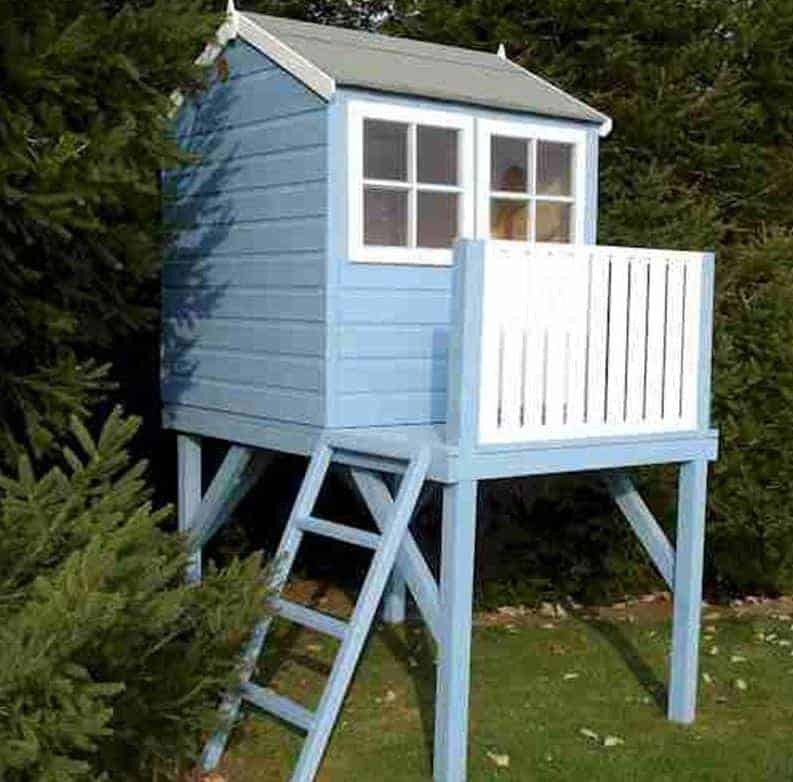 Towers, especially those with slides, have dominated the upper reaches of our guide to the 20 best playhouses for girls, and this example deserves its place at the very summit thanks to its relative affordability and the large dimensions of both the playhouse and the slide itself. Let’s face it, the longer a slide is, the more fun it is to the young people using it, and this has the longest slide of any of the girls’ playhouses that feature in this league table. The verandah at the front is a great spot to take a moment’s breather from running up the stairs and then going back down the slide, and its protected by a safety balcony although as with all elevated play areas adult supervision is necessary. If the weather is less than perfect your girls can head inside the playhouse and there’s an area of 2.11 X 1.46m to enjoy. With the tongue and groove cladding covered by a five year guarantee as well, your daughters or granddaughters will be able to enjoy this for year after year. 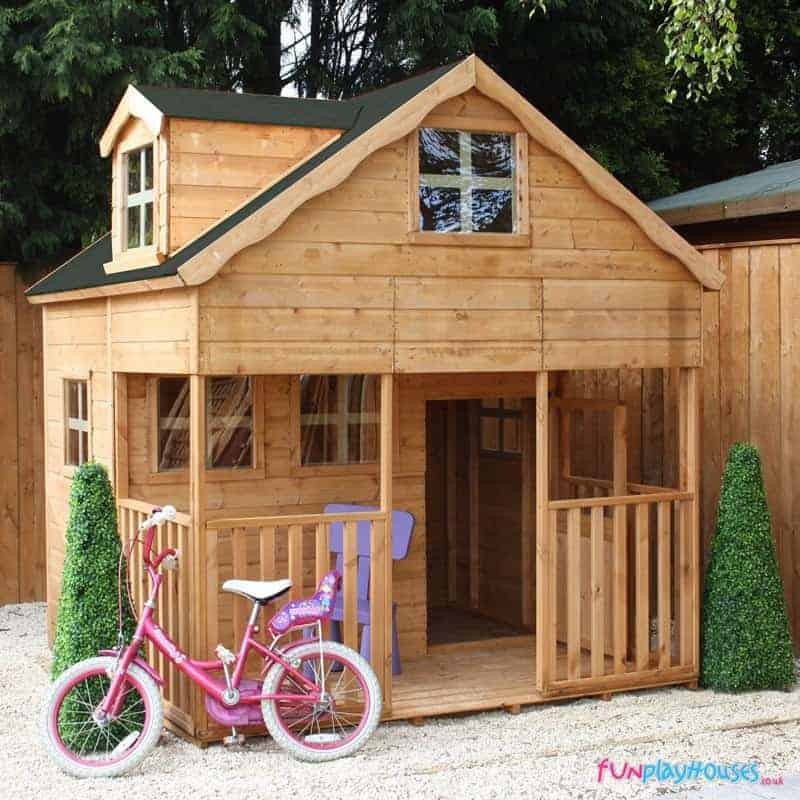 For all these reasons, as well as its good looks and affordable price, this hits the number one spot in our list of the very best playhouses for girls currently for sale in the UK. If you have young daughters or granddaughters you’ll know they can be just as energetic as young boys, if not more so, so it’s important to have a fun and safe environment for them to expend their excess energy in. That’s exactly what this rose tower activity centre offers, and we feel that whilst it’s not one of the cheaper playhouses for girls to make this top twenty list, it still provides more than reasonable value for all the features it offers. First and foremost is the playhouse itself, which is larger than most single storey playhouses we review in its own right. It has three styrene windows with an attractive criss cross design, and the hinged wooden door has a pretty flower design upon it. The playhouse is raised with a deep verandah with balcony in front of it, and is accessible via a safe ladder. At the other end of the verandah is a slide, and also attached to the playhouse is a very sturdy and completely safe wooden swing. There’s even plenty of room to play in underneath the activity centre, so the only that prevents it being named at the top of our playhouses for girls is its mere one year warranty. Nevertheless, it’s a great value buy with a lot to offer. What girl doesn’t like reading about the adventures of reading about the adventures of Winnie The Pooh, and of course his friends Eeyore, Piglet and Tigger? 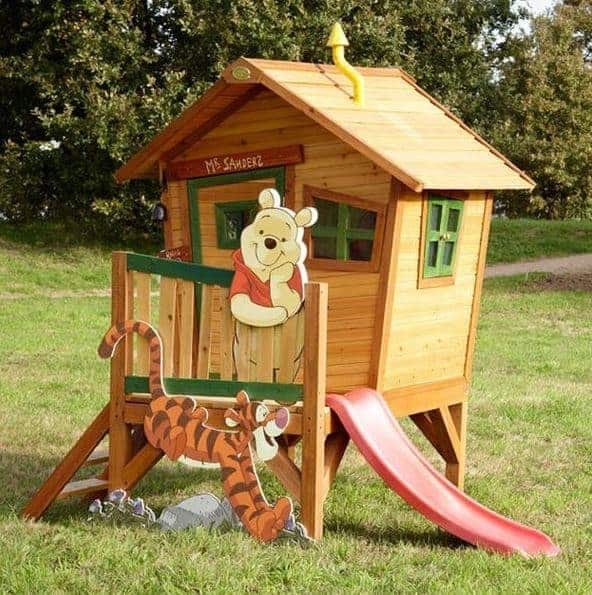 Now your daughter or granddaughter can have the perfect environment to read their favourite books or comics, or to pretend to be in the hundred acre wood themselves. This is such a fun play area, and yet it’s also very stylish and extremely well built, so we had to give it a high ranking in our list of the 20 best playhouses for girls. Simply as a playhouse it has to rate highly, with it’s uniquely fun and eye catching design. Everything is, deliberately a little wonky, with a bend chimney pot and three windows that are irregular and with no parallel sides. The door too is off centre, and yet they are all very well put together and create an exterior that like Tigger is fun, fun, fun, fun, fun and incredibly cute to look at. The playhouse sits on a raised platform accessible by three steps and with a pink slide at the other end. It also features beautifully crafted wooden cut-outs of Tigger and Winnie himself, which your girls will love. Made with thick tongue and groove cladding as well, this deserves its lofty position in out list of the best playhouses for girls. There is one overriding reason that this figures so high in our league table of the best playhouses for girls in the UK today, and that is the exceptional value for money it offers. 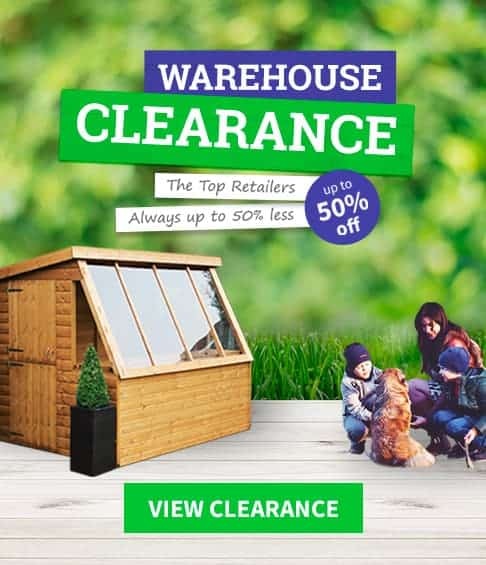 Whilst stylistically it may appear similar to some other playhouses, we’ve not seen anything else approaching this quality for under two hundred pounds. It’s also very durable thanks to tongue and groove cladding, a felt covered apex roof, a water based preservative treatment, and tongue and groove cladding that locks water out. Whilst all this caught our eye, and we’re sure that it will impress you too, what will be most important to the girls in your life is that it offers a lot of room to play in. 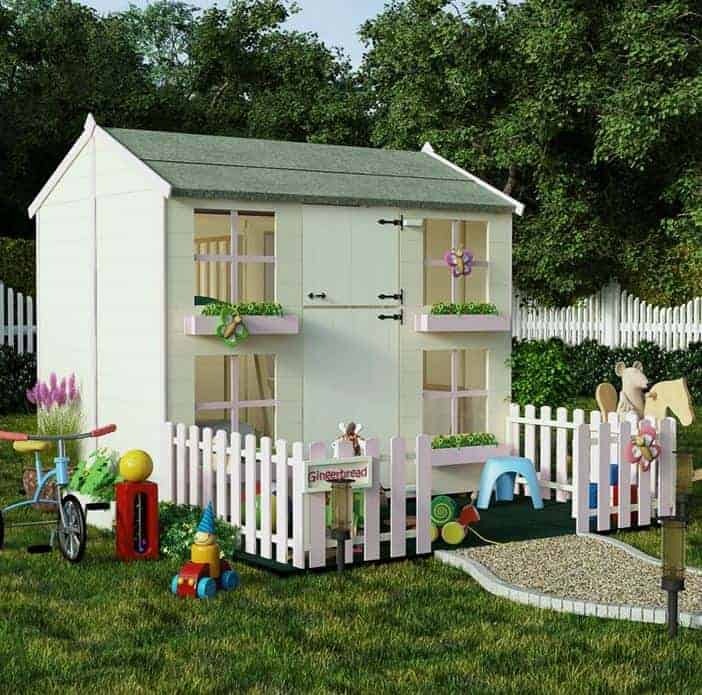 It’s width of 1.52m and depth of 1.46m are unusually generous for a playhouse in this price range, and there’s also room to play outside thanks to the good looking picket fence included as standard. There are four windows as well, featuring safe styrene as you might expect, so it’s even a suitable play area on a rainy day. It looks like a building that you’d expect to pay a lot more for, so this has to be one of the best value playhouses for girls available today. Children, both boys and girls, love to play outdoors and they love to climb, and the bunny platform playhouse allows them to do both things safely, under the supervision of an adult of course, in their garden. The playhouse itself sits on a raised platform that’s accessible via a safe and easy to use stepladder. This leads to a verandah area that has a balcony. It’s a great area for your daughter or granddaughter to stand and look out at the birds and butterflies in the garden, or simply enjoy a sunny day. One advantage this has over many other playhouses for girls is that the area underneath the playhouse is also large enough to be utilised, and it makes a great space to sit or lie in the shade. The playhouse itself measures 1.19m wide and 1.74m deep, and you’ll be surprised how many games and toys can fit inside. Whether your girls play games, draw, or read inside, they’ll be pleased of the natural light that comes in from the two square windows, and we were pleased to see that they were made of tough styrene. We were also pleased to find that the tongue and groove cladding features a 10 year anti-rot guarantee, which gives great peace of mind and added value. For these reasons, and for its highly affordable price, this achieves a lofty position in our list of the best playhouses for girls currently available online. 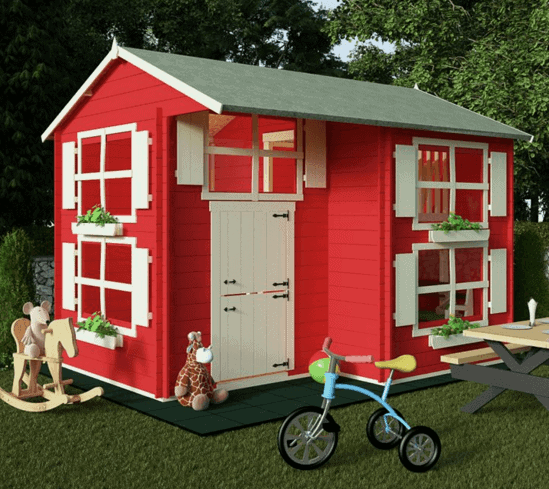 You may think it’s impossible to buy durable and spacious playhouses for girls for less than a hundred and fifty pounds, but as this good looking playhouse shows you’d be wrong. 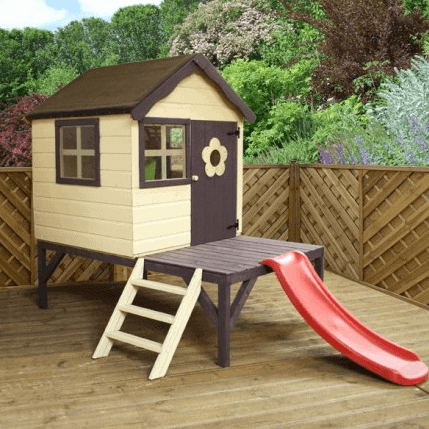 When reviewing this playhouse we found a lot to like about it, even though it lacks the bells and whistles of some we review, but of course the price was the thing that we most liked about it as it makes the advantages of a timber playhouse accessible to all. When painted in the favourite colours of your daughter or granddaughter this will become their favourite part of the garden, and they’ll be inviting their friends around to play. With a width of 1.27m and a depth of 1.14m this has a more than adequate play area for two girls aged three to seven. They won’t have any trouble seeing what they’re doing thanks to four styrene windows, and they’re sure to find it a warm and dry, as well as fun, environment. That’s because the walls are made of tongue and groove cladding; it’s a feature we wouldn’t necessarily expect to see in a playhouse as affordable as this, and it’s very good at keeping the rain out. For those reasons, and the inclusion of floor joists that protect the base from ground moisture, a 10 year anti-rot guarantee is included. 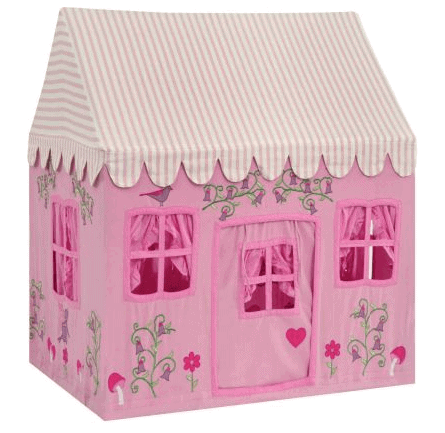 This value and durability made this a worthy inclusion in our top 10 playhouses for girls. This isn’t one of the largest playhouses for girls we’ve reviewed, but it does provide plenty of opportunities to have fun, especially since it features a pinky red coloured slide. We’ve reviewed several playhouses with slides attached, and whilst we always welcome that feature we feel this one is particular suitable for younger girls because it’s a relatively shallow and low level slide. In short, it’s a great introduction for a child who hasn’t discovered the delights of using a slide before., and the compact footprint of the play area as a whole won’t take up too much room in your garden. The timber playhouse itself has a traditional design with three styrene windows, and an attractive round window in the door surrounded by a decorative flower petals design. With a width and depth of just under four foot each, there’s still enough room to play games inside, and as the playhouse is raised slightly above floor level, and accessible via three safe and sturdy steps, there’s room for storage or shaded relaxation under the building too. We would have liked to see thicker cladding used than the 8mm tongue and groove we found here, but even so this makes an excellent first wooden playhouse for girls. 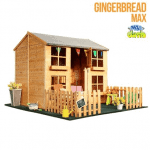 Everyone likes gingerbread, and now it’s not only a tasty snack but also a name to look for when it comes to high quality playhouses for girls. 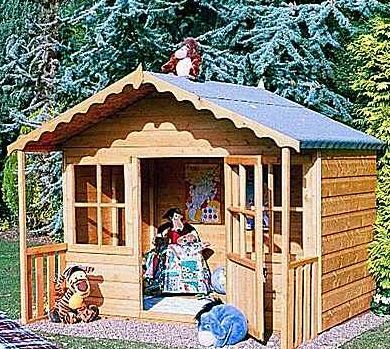 This is one of the larger timber playhouses we’ve reviewed, especially for a price tag of less than three hundred pounds, and its extra height, enclosed by an apex roof that tops out at 1.90m, allows for a second bunk level to be included within the building. With more space, of course, there’s lots more room to play in and we can imagine one girl reading a book or drawing on the top bunk while a couple of friends or siblings play below. As well as the two story playhouse itself there’s also a verandah area enclosed by an attractive picket fence, which means that your little girls can play safely inside and outside while you supervise them. There are four windows, but with tough styrene glazing you won’t have to worry about breakages, and a fun stable door with a shorter top section. The tongue and groove cladding used for the walls creates a strong and stable structure, although the roof is made of solid sheet material and an integrated floor is an optional extra. 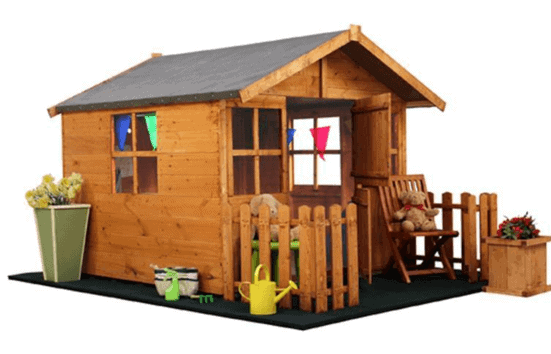 For such a large and good looking play area we feel this is one of the best value playhouses for girls available to buy online in the UK today. 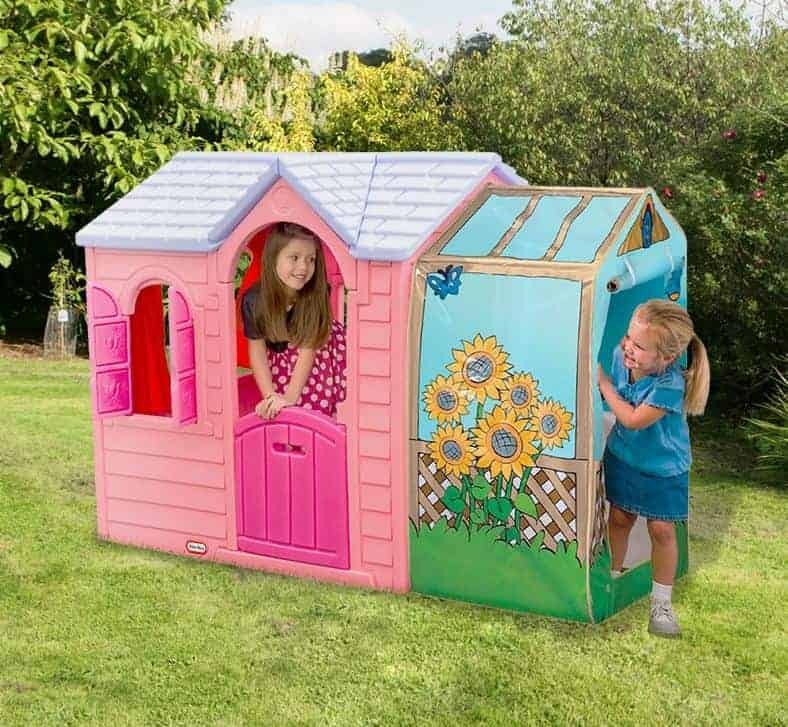 Even within the top ten of our list of the best playhouses for girls there’s room for a compact plastic playhouse, as this example is very well built, attractive, and very good value for money. One of the things we liked most about this building, and which set it apart from other plastic playhouses with similar designs, is its attractive white and lime green colour scheme. Being made of tough moulded plastic it’s easy to clean away finger marks, and as the cladding has been given an anti-UV treatment you won’t have to worry about the colours fading in the sun. With a width of 1.15m and a depth of 1.35m there’s enough room for two girls aged three plus to share and enjoy, and they’ll find the interior very light and cheery thanks to two square windows, which come complete with plastic shutters, and two round portholes. There’s also a fun tablet type device included that’s a great way to introduce youngsters to the skills they’ll need to operate tablets and computers in later life, so you’ll need to buy one AAA battery to run that. At a price of well under two hundred pounds, despite its lack of sophistication this deserves to be the highest ranked of our plastic playhouses for girls. Most of the wooden playhouses that we review come unpainted and whilst that allows you to use them as a blank canvas, it can mean that your daughter or granddaughter isn’t as excited as they could be straight away. That’s not the case here, as the timber is pre-painted in a striking pink colour that shouts of fun and happiness from the moment the installation is complete. It also has a strikingly original design that makes it stand out from many of the other cottage style playhouses that we’ve reviewed. For this reason, and for its range of additional fun features, it deserves its place as the first of our top ten playhouses for girls. The additional features may be small, but they can make a big difference as they create a fun environment with lots of potential for imaginative play. At the top sits a decorative chimney, which is something that we hadn’t seen before, and there’s also an American style mailbox and a side porthole to go along with the large front window and the smaller square glazing on the front door secured by a magnetic latch. Its dimensions are generous too, with a width of 1.87m, depth of 1.20m and height of 1.80m. It’s worth noting that the roof will need felt affixing to it to make it rain proof and this, with its higher than average price tag, stops it from being higher up in our playhouses for girls league table. We’ve reviewed lots of timber playhouses, and yet this is one of the most aesthetically pleasing that we’ve seen. Even in its natural state it will be an attractive addition to your garden but when painted in colours that your daughter or granddaughter loves, which has the added advantage of protecting the timber from UV found in the sun’s rays, it will become a much used area for them to play and relax in. It has a unique styling among the many playhouses for girls we’ve seen in that it is higher than one side, which has two floors, than at the other, but this asymmetric design has the effect of creating more space. This extra space takes the form of an extra bunk area, accessible via a safe internal ladder, with the area underneath the bunk being an ideal location to store games, dolls, or reading materials. It’s solidly constructed out of tongue and groove cladding, and while the initial use of a dip treatment means that the customer will have to add their own wood preserver coatings in future years, we were pleased to see that it comes with a 10 year anti-rot warranty as long as the treatment schedule is adhered to. There are also three large windows with styrene glazing, as well as a smaller glazed diamond on the door. Even though this isn’t the cheapest that we’ve reviewed, it deserves its place among the best playhouses for girls for its generous dimensions and attractive looks. 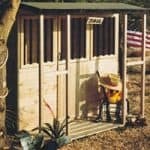 Log cabin style playhouses for girls are a very stylish addition to any garden, but they can take a lot of maintenance and may not be ideal for younger girls or those who love to have fun while getting messy at the same time. 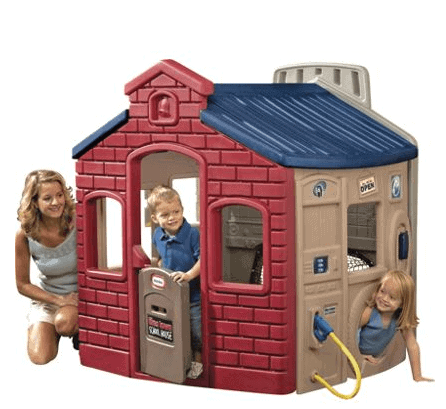 This log cabin effect plastic playhouse can be a perfect compromise. Being made of plastic it’s very quick and easy to assemble, easy to clean, and is very tough and durable too. Those are just some of the reasons that we rate it so highly in our list of girls’ playhouses, but even more importantly it’s lots of fun too. Whilst the shape and structure is designed to represent a log cabin, the colours are bright and bold from the green roof to the red door. Its two windows are shuttered and there’s also an opening above the barn style moulded plastic door. Another feature which we liked, simply because we know how much young girls will like it, is the pretend phone accessory hanging on the wall. With a friend or sister over to share in the fun they can invent their own little world inside the rain proof four walls, and there’s more than enough space for two or even three little tikes. 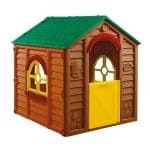 Overall, we feel this is an ideal introductory playhouse for girls aged between two and six. We find that the best playhouses for girls tend to take two forms, ones that are bright and vivid yet relatively simple, or those that are beautiful and sophisticated. 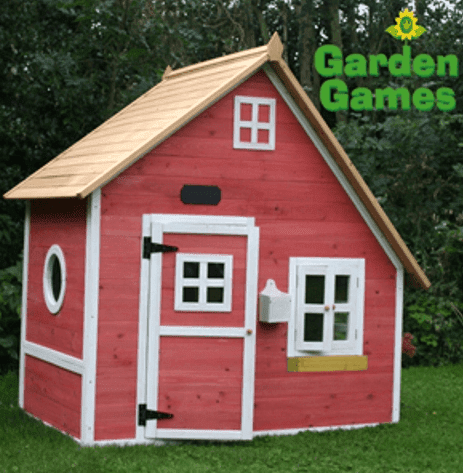 This playhouse from Shire definitely belongs to the latter category but as it’s supplied unpainted it can be transformed into something fun and spectacular that your girl will love with the help of some yellow or pink paint. It takes the form of a miniature log cabin or chalet, and we can imagine it being a much loved place to hold a pretend tea party with dolls and bears. With a solid apex roof and tongue and groove cladding, you won’t have to worry about rain reaching the interior. There’s extra protection from the elements out front as well thanks to an overhanging roof that forms a natural verandah area. It also provides shade around the doorway, which is very useful on a hot summer day. 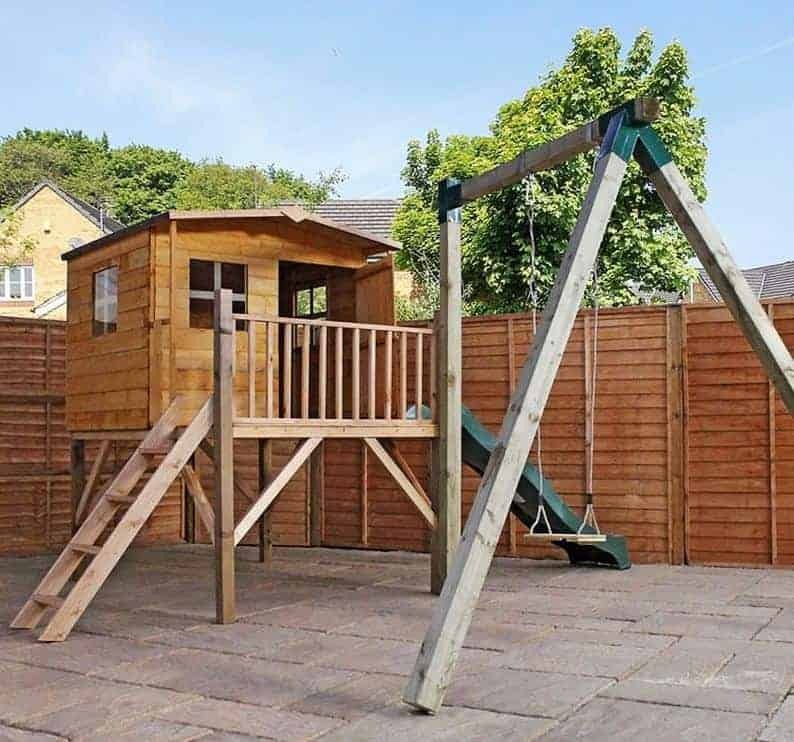 With a width of 2.02m, a depth of 1.74m and a height of 1.57m there’s lots of space available to play in, and even though it only has a one year warranty period it does represent good value for money. That’s why we feel this deserves it’s mid-table position in our list of the 20 best playhouses for girls. 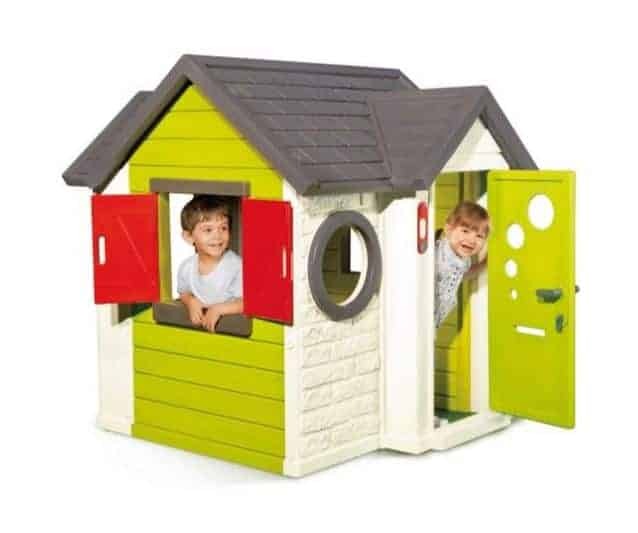 Whilst this very versatile and good value for money playhouse makes our list of the best playhouses for girls it’s also suitable for young boys. With the four faces of the building each featuring a distinct theme, it’s ideal for those who have both girls and boys in their family. The themes are a school, petrol station, shop, and sports station. What we particularly liked about this playhouse is that each side features a range of accessories from a netball hoop and football net, to a play cash machine and petrol pump. The interior features plastic shelves which can be used for play or storage purposes. Each side has its own unique windows and way of getting in and out, and for less than three hundred pounds there’s lots here to keep even the most energetic of children occupied and amused. The contrasting pink and grey walls with a blue roof are sure to catch the attention of youngsters, and its plastic construction means that it’s very durable and you won’t have to worry about painting or treating it. It’s not the most stylish or elegant playhouse for girls that we’ve reviewed, but if you’re looking for a practical, low maintenance, environment that encourages imaginative play this ticks a lot of the right boxes. This again is one of the most eye catching playhouses for girls that we’ve seen, and is only prevented from being placed further up our league table by its price tag. If your budget will stretch to a price of nearly seven hundred pounds however we feel it’s certainly worthy of consideration as not only is it a large and exciting area for your girls to play in, it will also be an attractive feature for your garden. There are two levels, meaning that there’s lots of room to play in, with the upper level overhanging the lower verandah area. There’s also a dormer window, and it’s just one of six in the playhouse as a whole. They not only fill the interior with light, they’re also made out of safe styrene so you won’t have to worry about them breaking or shattering. One of the things we liked most about this playhouse is that it’s very weather and rot resistant. The roof itself stops water getting in, as does the shiplap cladding, and ground moisture is kept out by the inclusion of pressure treated floor joists. What your daughters or granddaughters will like most however is that it’s very big, measuring 2.09 X 2.11m and with a height of 2.38m, so they’ll have plenty of space to play their favourite games or read a comic or book. For these reasons, this is a worthy member of our league table of the best playhouses for girls. 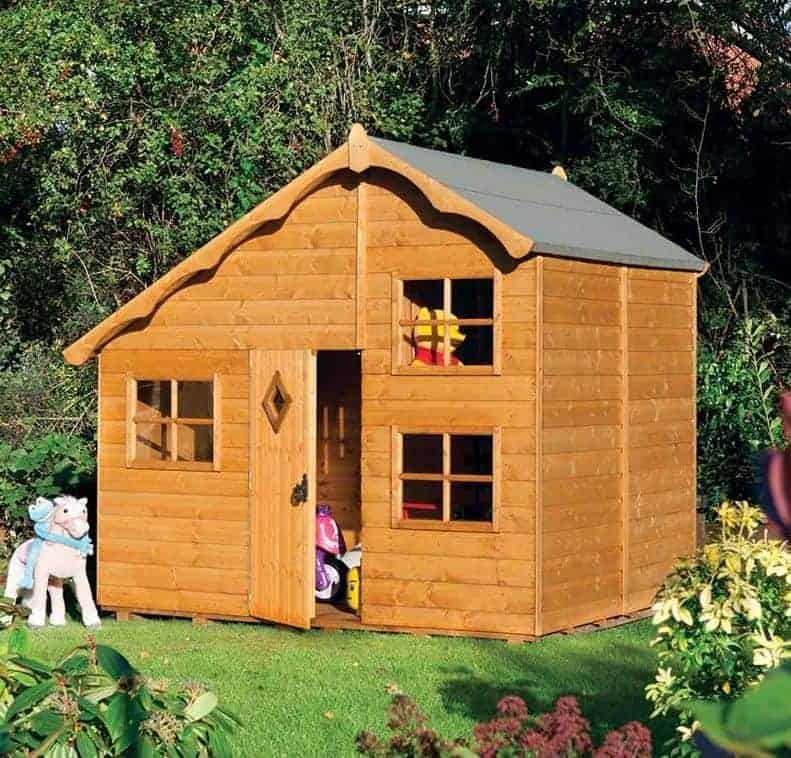 There are many reasons why this superbly designed luxury timber playhouse is ideal for the girls in your family, and one of them is that it closely resembles the home that they live in. It has a a satable style door, meaning that both parts can be opened separately, five windows, and an apex roof. All of the windows feature shutters, and four of them have window boxes so that you can teach your little ones the joy of planting flowers, watering them, and watching them grow. This is one of the larger playhouses for girls we’ve reviewed, with a width of 3.13m and a depth of 2.56m as well as a height at the peak of the rain repelling roof of 2.40m. The building is so tall because it has two levels, with a raised bunk area accessible by an internal ladder and guarded by a rail. One thing to note is that the thick 19mm tongue and groove cladding will need a water based preservative applying to it on a regular basis, although it does come painted in a very attractive red colour scheme that young girls will love. This need for annual re-treatments and its high price point are the only reasons that this isn’t among the upper echelons of our top 20 playhouses for girls. 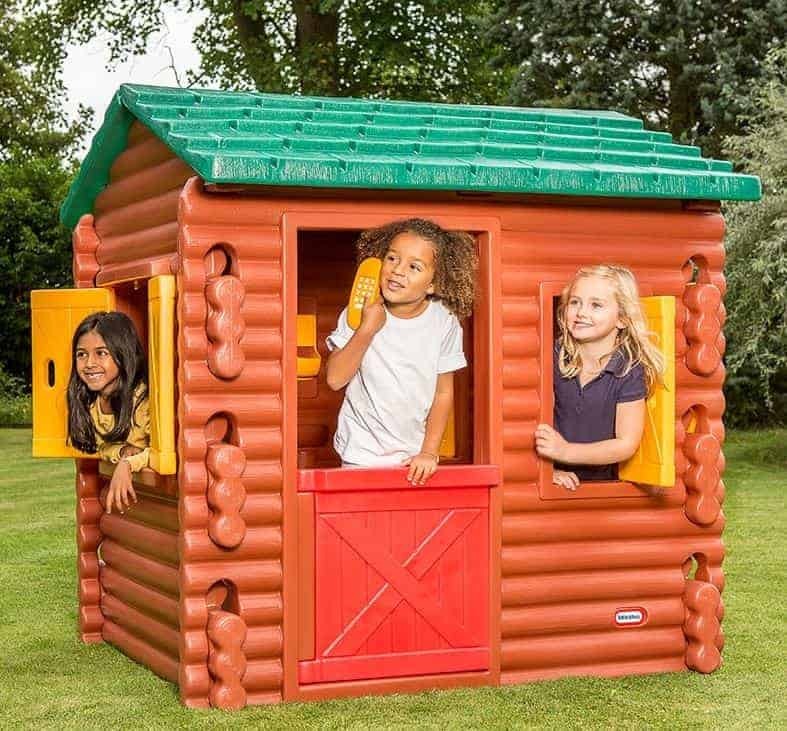 We now come to another wooden building in our list of the top 20 playhouses for girls in the UK, and this really is an excellent example that would be placed much higher if it wasn’t for a price tag that will put it out of the reach of some potential buyers. The playhouse itself features a wooden door, one fixed window, and a classic cuboid design with an apex roof reaching to 1.50m above the ground, and it has a width of 1.35m and a depth of 2.10m. Both of these dimensions however exclude the terrace which stretches out from the playhouse itself and ends in a wooden balcony. This terrace is one of the differentiating features that made this stand out from many other playhouses for girls, and we also liked the fact that the playhouse is raised slightly above ground level. This means that the floor is protected from ground moisture, and it also creates an area underneath the building that can be used for storing toys. It’s not too high up, and is reached via just two steps, so it’s a safe as well as fun environment. We were also impressed by the fact that thick 16mm tongue and groove timbers have been used throughout, and that they’ve all been pressure treated. This creates a very durable and weather proof environment for your girls to play in. This is possibly the simplest playhouse for girls that features in our league table, and yet it’s deserving of its place because of its fun and eye catching design and a little extra touch that will be really appreciated by your special girl. As well as the playhouse itself it comes with a matching quilt measuring 0.95 X 1.10m. This means that this becomes an ideal surprise gift, or even birthday present, for a ballet and dance loving youngster. Children of all ages love to go to dance classes, and as well as providing a fantastic form of exercise for them, it also means that they’ll dream of being a ballerina. This girls’ playhouse allows them to indulge that dream to the maximum. 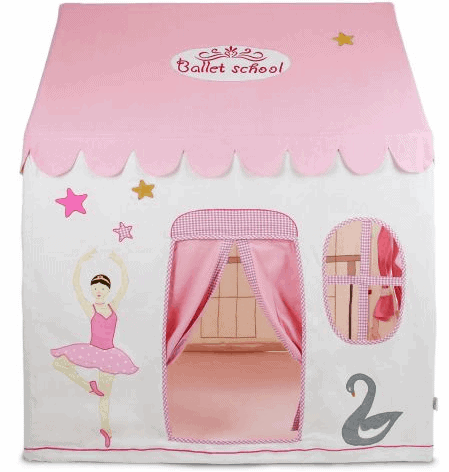 With a pink and white colour scheme the roof section of this fabric playhouse bears the legend ‘ballet school’ and on either side of the door stand a ballerina and a swan. Above the swan is an attractive oval window with pink and white detailing. Further windows are found on the sides which continue this fun theme. With a tough aluminium frame providing stability it has a width of 1.00m, a depth of 1.20m and a height of 1.50m and is likely to be great choice by you if your daughter or granddaughter is a ballet fanatic. Don’t let the fact that this girls’ playhouse is constructed primarily of plastic put you off, because if you’re looking for durability, convenience, and ease of assembly then moulded plastic, as used in this instance, is an ideal substrate. It’s for these reasons that this offering from Little Tikes makes our top 20 playhouses for girls list, but it’s so bright and colourful that it’s sure to prove popular with younger girls especially. It’s also more accommodating than you might think at first sight, with a width of 190m and a depth of 1.04m, and it’s ridge height of 1.30m, well in excess of four feet, means that you won’t have to worry about bumped heads. One thing that elevated this above some other compact plastic playhouses is that it features two distinct areas. The main body is a pink plastic house with a barn style half door and two shuttered windows. Adjacent to it however is a fabric porch featuring an attractive illustration of a garden with sunflowers. This has a roll up door which children will have lots of fun going in and out of. This is in many ways a basic playhouse, but it’s designed with fun in mind and that’s why it deserves to be counted among the top 20 playhouses for girls available today. The majority of playhouses for girls that make our top 20 league table are made from timber, but that’s not the only substrate that can be used to create an enjoyable play area for your daughter or granddaughter as shown here. This simple yet effective playhouse has a fabric exterior, and yet the fabric itself is tough and resilient and so it won’t easily be ripped or damaged by over eager little hands, or even the vagaries of the British weather. In a pink colour scheme with a candy stripe roof it’s sure to appeal to young girls who love that colour, and we liked the clever usage of its four sides, with two containing images relating to an enchanted garden and the other two representing a fairy woodland. We feel this bright, vivid imagery will really stimulate a girl’s imagination. Although fabric is the main component used, it was good to see that it was supported by a strong metal frame. That means that it’s strong and sturdy and yet lightweight. It’s also remarkably easy to assemble, and can be ready to play inside in under half an hour. For that reason it can be used inside or out, and if its width of 1.10m and depth of 0.75m isn’t quite enough a larger option is available. Providing simplicity, fun, and great value for money this is worthy of its place in our top 20 collection of the best playhouses for girls.